This was a shot which I had attempted two years earlier, planned well in advance by calculation of the sun's azimuth and altitude when seen from this location, so it was just a matter of patience - and good fortune - that the right conditions would prevail during the window of opportunity that I had identified. 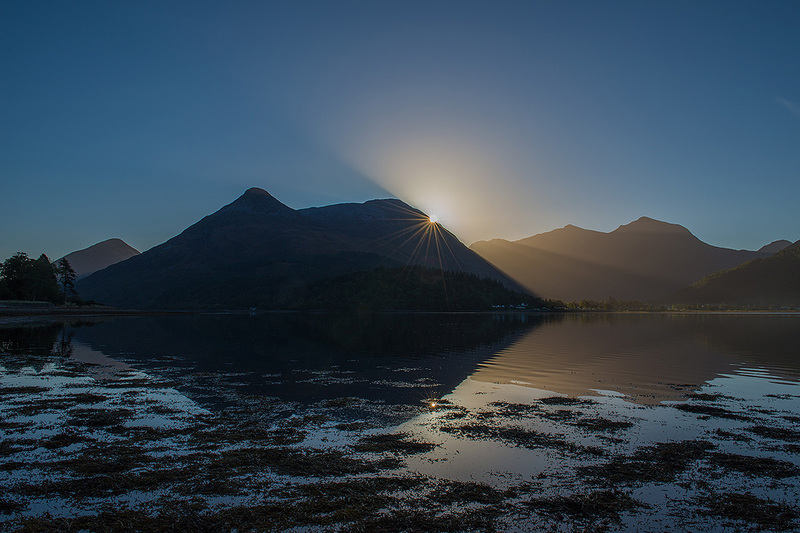 It is a classic viewpoint for The Pap of Glencoe and the Bidean nam Bian massif and I had taken many images from this location before, but on this occasion I wanted something different and chose to capture sunrise. The 'starburst' pattern and characteristics are down to the construction of the lens and the overlapping nature of the aperture blades, and not the use of any external filters. Success with a shot like this is down to assessing and maintaining the correct exposure of the composition before the sun appears in it, and then capturing the sun at the precise moment that the first rays of light emerge. I usually achieve this by selecting continuous shooting on the camera and taking around a dozen images over period of two to three seconds. It follows that the focus and exposure were carried out manually. Equipment : Canon EOS 5Ds, EF 24-70mm f2.8 L II USM Lens @ 28mm. Gitzo Systematic tripod, RRS BH-55-PCPRO head. Camera Settings : Shutter 1/100 sec, Aperture f11, ISO 100.